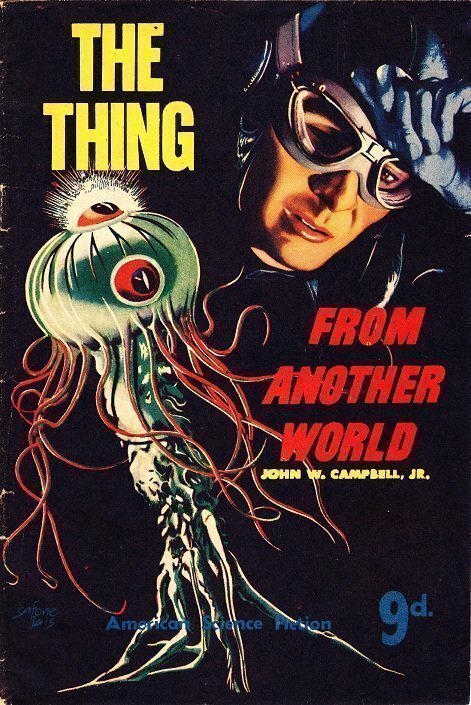 The Thing from Another World by John W. Campbell, Jr.
Hello. I’ve been invited to write pulp-relevant articles and share them with an audience whom will readily appreciate the literature, and receive a broader scope of exposure. After some vacillating, I decided to give this adventure a try, and delved into my own older blog entries, and post them here, where you, the more relevant and direct pulp audience, may readily receive, and hopefully, contribute your thoughts and opinions with the world. You see, fandom has deteriorated in recent decades and lost all sense of direction, and, fan-family. The world as fandom knew it, eons ago, that sired the wonderful fanzines of a forgotten era, and the jubilantly wild and crazy conventions, are dead and past. Most, if not all members of First Fandom, are dead, and I’m not too sure how many members of Second Fandom are around, but thankfully, there are a number still kicking. My initiation began with collecting a variety of vintage paperbacks, and not having any real direction. When the Internet was introduced (to me) my world expanded, quite quickly. What little I learned and gleaned from the occasional fanzine that came my way or letters of correspondence I received suddenly was like opening my eyes to the sun and having it violently engulf me. Then I met Howard DeVore, and he insisted I drive up to his house in Dearborn, Michigan, and have a damn good time romping through his garage (mostly mass market paperbacks and filing cabinets of fanzines and a couple mimeograph machines). I helped to heave him upstairs, to the attic, where his quality pulps, paintings, and foreign publications, were stored (downstairs, in the tiny living room, were bookshelves of hardcovers). It was upstairs that my collecting interests took an altered course. Now, Howie was by no means responsible for my insatiable desire to the collect the (Famous) American Science Fiction (Magazine) series that was printed by the Malian Press, in Australia, during the early 1950s, however, one can readily trace my foreign collecting interests directly to his attic (but THAT is for another future article). The “magazines” are actually digest-sized side-stapled pamphlets; all 41 issues are 36-pages in length, and each sport original full color cover art by Stanley Pitt. That latter alone makes them quite collectible. Naturally, for collecting enthusiasts, the fine grades are the most desirable, and, given the vibrant quality of the art, rightfully so…. Without further ado, let’s touch upon issue #5, THE THING FROM ANOTHER WORLD, printed September 1952. Deciding to learn the secrets of the alien race, they slowly thaw the sinisterly evil-looking critter (always a great idea, right?). One of the crew remains awake to watch over the melting process, (drip drip) goes about his work, (drip drip drip) and the floor creaks (no more dripping)…. Shift to next scene; said guy watching over critter wakes up the commander, and proclaims the alien has escaped! But, when their pack of dogs begin screaming, howling, and roaring, they soon know where to search. They find a monstrosity out of hell, a shape-shifter, midway between alien and dog dimensions, being ripped and torn asunder by the frenzied dogs. One of the crew goes insane and calls them (the humans, that is, not the dogs) all aliens, distrusting the whole lot of them, and they lock him away, far away, in an isolated room of “junk” and “parts,” where he can do himself and others, no harm. Realizing that The Thing has shifting capabilities, the crew panics, and determine that the crew member originally assigned to watching over the “melted one” may himself be an alien. Various “tests” are concocted…. The truth is learned; there are numerous “replaced” humans among their own kind! Fast-forwarding, the humans finally kill off all the aliens, or have they? What about the fellow that went insane and was put into isolation? Is he human? Or was he merely mimicking? The crew dart out there, pry open the doors and….let me assure you, the story has nothing to do with the movies, so I do suggest you read the story. Get off your duff and grab a copy of the tale yourself. Copies abound in “cheap” reprint editions. It’s been probably a decade since I read “Who Goes There?” But I still remember the ending so vividly I think I could probably quote the last few lines almost verbatim. If that’s not a testament to Campbell’s profound literary talent, I don’t know what is. As a young fan of the pulps (being not yet thirty) I would love to hear more about the history of the Fandom and the generations that have composed it. I recognize that my collecting hasn’t quite developed a focus yet as well, so hearing about your experience in that attic was a treat. Hello Bill. Thanks for the reply. Personally, I’m eternally grateful for the rare opportunity that Howie gave, permitting access to his home, and the attic. Defining the history of fandom is nearly impossible today. The best thing to do is obtain published histories on fandom by reputable sources, not via the Johnny-come-lately crowd that simply want to make money writing ABOUT the history and plagiarizing from earlier sources. (I won’t name a certain Englishman). However, I highly suggest you dial back to one of the earliest fan-written histories, by renowned fan historian Sam Moskowitz, published in 1954. It’s a great starting place, however, the book is quite scarce. Generally, I do NOT like to post Wiki stubs, because they can often by erroneous, but in this case, it is a good starting place. The entry discusses him. The book is THE IMMORTAL STORM. It originally appeared as a series of articles in a fanzine, then was collected in 1954 and bound, and has since seen some reprintings. If you can’t get the original, don’t lose sleep over that. Grab the cheapest copy available. If you are interested in British fan history, then I heartily suggest Phil Harbottle’s VULTURES OF THE VOID, the newly re-released and updated version (not the original edition).